The true pioneers of community solar in the southeast are those taking on the enormous goal of bringing it to their respective community or institution, whether it be a faith community, municipality, school or service organization. Any honest assessment would certainly conclude that such projects are especially difficult in our region of the country. Some of the projects that AIRE has assisted are highlighted below. Together, we’ve learned much from these efforts. But for each success, there are many more aspiring pioneers that were never quite able to develop a project. These experiences are equally important for the sake of building knowledge and its contribution to finding new solutions. Now, our collective learnings are taking place in the rapidly changing political and energy landscape. While new threats to renewables and smaller-scale solar in particular will emerge, growing interest and the market fundamentals point to expanded opportunities. For AIRE, those opportunities are grounded in the recognition that solar is becoming more affordable, grid power is subject to inflation, the potential to improve livelihoods and community wealth through local and regional solar value chain creation, and the net-positive public value of solar. Rowan-Cabarrus Community College is led by an extraordinarily visionary senior management team. They started with the idea that solar power should be a significant energy source for the college, and that the on-campus solar projects they intended to build should be seamlessly integrated with curriculum for the benefit of students, faculty, staff and the greater community. After all this is an institution of higher education. But this was to be a major initiative and thus they recognized that the scale and impact befitting their vision would require significant financial resources. AIRE began working with the college in 2013 to help it develop solar on campus with third party financing as the original plan. The college, through its foundation, received a very generous donation to leverage what was hoped to be an empathetic third party investment in solar on the campus. However, after evaluating many investor proposals, it became clear that the most aimed to take the donor money, all of the tax credits (discounted, of course), all of the power sales revenue for many years, and some even asked for a buyout fee when the system was conveyed to the college. Even though the project was bankable under investor terms, we felt is simply wasn’t best for the college. We began to see the downside to projects of this scale using third party tax equity finance because the investor claimed the lion’s share of the benefit, rendering the college’s benefit to little more than rents for 10 years and delayed benefits for the remainder of the system’s life. In short, we saw the colleges value being diminished by the tax equity proposals. We started with the axiom of “doing well by doing good,” an admirable ambition. Striking that balance here proved harder said than done. At the same time, prices of solar were dropping off the cliff. 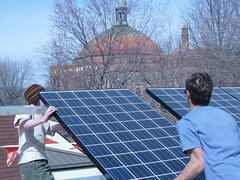 We began to evaluate other strategies to bring solar on campus and keep the teams audacious solar vision moving. RCCC decided to reconceive the plan in two phases, the first now would be a roof mounted system along with a solar electric vehicle charging station. 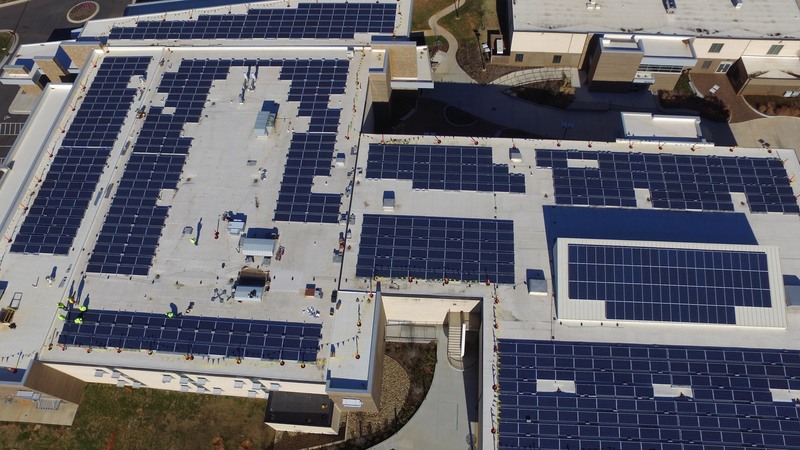 To date, the RCCC Foundation’s renewable energy developments include a 268 kW rooftop solar array (operational Q1, 2017), a 50 kW carport solar array (operational Q1, 2017) installed by Yes Solar Solutions of Raleigh, NC. NEW— The 1,000 kW ground mounted solar array that has been in the various stages of planning for several years is currently under construction. Very exciting. DONALDSON, IN – The Poor Handmaids of Jesus Christ are proud to announce the first phase of a renewable energy effort, starting with two solar arrays at The Center at Donaldson. The 280-panel, 83 kilowatt (KW) installation is the culmination of 20 months of research and energy-related efforts completed by a project team led by Adam Thada, Director of Ecological Relationships. The team first compiled data on electricity usage across campus. To gather ideas, they visited several solar and energy efficiency projects across the region. The first step was an LED lighting retrofit at the Motherhouse, Ancilla College, Lindenwood Retreat and Conference Center, and Catherine Kasper Life Center. Thousands of old lights were recycled with help from the Marshall County Recycle Depot and replaced with high-efficiency LEDs. A NIPSCO efficiency program helped defray some of the costs. The Center at Donaldson was aided by Appalachian Institute for Renewable Energy (aire-nc.org), who specializes in working with non-profits to effectively own and operate renewable energy systems. AIRE assisted the project team in choosing the best installation site and vendor for the project. Ag Technologies, Inc. of Rochester, IN will be installing the arrays this summer, using U.S.-made Solarworld panels. Their patented SolarCAM® system consists of ground-mounted, tiltable arrays that are adjusted four times per year to track the sun’s angle for maximum energy production. The two arrays will help power MoonTree Studios art gallery and The Center at Donaldson’s wastewater treatment plant. The systems have no batteries for energy storage, but rely on “net metering.” Excess power produced during the day is sent back to the utility’s grid and credited to the customer, who draws power when the sun goes down. “There is still a window of opportunity for homeowners, businesses, and local governments to sign up for solar net metering during the next couple years,” said Thada. According to the 2017 Net Metering Report, more customer-owned renewable energy was added in 2017 than in all previous years combined. Indiana now has nearly 2,000 net metering customers. The project team will monitor the solar system’s performance and watch trends in the renewable energy industry to determine how a larger Phase 2 project could be implemented. Sustainability initiatives that improve the environment – and save money – are nothing new for the congregation of Highland United Methodist Church of Raleigh, NC. Highland UMC has installed low-flow plumbing fixtures that conserve both water and $400 per year of the church’s operating budget. They have a community garden that produces 2,000 lbs of produce each year. Most recently a group of the church’s members engaged AIRE to assist them in developing a 45 kW solar electric system (large enough to create the yearly electricity required by 8 energy efficient homes) on one of the sanctuary’s flat roof spaces. The system, when donated and owned by the church, will save $6,000 or more each year in electricity cost, producing clean energy for the system’s 20 plus year remaining lifetime. 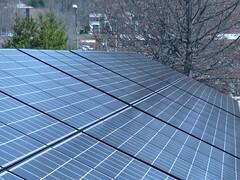 The solar electric system was designed and installed by Inman Solar. The Resource Innovative Design Group (“RIDG” and pronounced “ridge”) is a program of the Appalachian Institute of Renewable Energy (AIRE). At RIDG, we see waste as a failure of our culture and economic system that leads to unnecessary human and ecological conflict. Energy is embedded in everything, including the things we typically throw away, and we need to plug that hole. Our mission is to build community wealth and wellbeing through the harvest of waste streams and the renewal of natural resources. By identifying relationships between failed resources and their potential uses, RIDG will incubate new microenterprises and grow a renewable resource network. We support our mission with research, education, and collaboration. See an earlier AIRE blog post introducing RIDG. The Hospitality House of Boone, NC is a non-profit community support center that transitions individuals and families from crisis to stability, poverty to sustainability and homelessness to self-sufficiency through the provision of food, shelter and supportive services. The Hospitality House worked with AIRE to lower their energy bills by developing a solar hot water heating system at their home facility. The solar water heating system is comprised of nine solar energy collectors (each four feet wide and 12 feet high) and a 600 gallon water storage tank that produces about 25% of the hot water required for the the 70 bed facility and its commercial kitchen. The project was completed with $25,000 in funding from Blue Ridge Electric Membership Corporation and $18,000 from Appalachian State University’s Appalachian & the Community Together (ACT) program. The solar system was designed by Renewable Design Associates (RDA) of Ashveille, NC and installed by Sundance Power Systems, also of Asheville. Since 2010, ECC’s Green Church Committee has been working diligently with the Appalachian Institute for Renewable Energy (AIRE) to install a solar array funded by their community. AIRE’s financial model allows community investors to own and operate the system for six years while realizing the tax incentives offered for renewable energy development. After this period, the system is then donated, or sold at a deep discount, to ECC. AIRE worked with the church to identify and engage potential funders within their supporter base. AIRE managed the financial and legal structuring of the business entities developing the solar system and owned by those church members funding the project. The installation was conducted by Sundance Power Systems, Inc. who offers service throughout North and South Carolina, and is “committed to participating in the healing of the planet and creating a sustainable quality of life for humanity through the introduction of renewable energy into society at large” (www.SundancePower.com). ECC’s new solar array was fully funded by investors and donors from the church’s community, dedicated to demonstrating their commitment to the care of God’s Creation. On January 23, 2013 citizens and government officials from the Town of Carrboro held a ribbon cutting ceremony to celebrate the installation of a 5 kW solar photovoltaic system on the Farmer’s Market at the Town Commons. In an effort to “lead by example” the Town of Carrboro contracted with the Appalachian Institute for Renewable Energy (AIRE) to assess the physical and financial feasibility of the project, manage the financial and legal structuring of the development, and oversee the installation process. The installation was completed by Sundance Power Systems, Inc. who offers design and installation services throughout North and South Carolina (www.sundancepower.com). 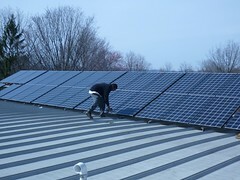 Fully funded by a group of local citizens, the Carrboro Solar Community Initiative (http://carrborosolar.com) provides clean energy to Carrboro’s Town Hall, an example of local energy independence, and an educational opportunity on the benefits of renewable energy. Utilizing AIRE’s innovative approach to community developed renewable energy, local investors formed Carrboro Community Solar, LLC (CCS) which will own and operate the system for six years, in order to recognize the full financial benefits. At the end of the six years, CCS will donate or sell the system to the Town of Carrboro at a deep discount, for the future benefit of all Carrboro’s citizens. This historic church, located in downtown Asheville, North Carolina, was the first group to utilize our Innovative Social Finance model and engage in our Project Development process. Their 10 kW system (42 panels) was installed by Sundance Power Systems and is situated above their Fellowship Hall. Nine individuals raised the capital investment for the project, all but one of which are a member at First Congregation United Church of Christ. 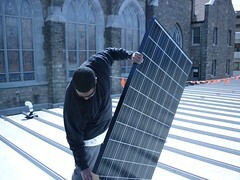 “First Church Solar, LLC”, the company AIRE assisted members in organizing, envisions donating the system to the church in about six years, at which point many of the investors will have made their money back, and some with a return. Return on Investment (ROI) depends on the tax appetite and financial portfolio of each individual investor. As First Church Solar, LLC was able to raise more money than required for their first solar project, they are planning to organize and capitalize another such project on a church in their community. The goal of Boone Community Solar was to explore the question: “why is there so little renewable energy in a place like Boone?” Boone’s rooftops and parking lots have excellent solar resources, which, if developed create jobs, raise locally owned investment opportunities, and forge community owned civic infrastructure that improves the economy and environment of all those living in the region. In 2009, North Carolina spent over $2.5 billion to import electricity. We could keep a large portion of this money in our state economy by developing renewable energy systems in North Carolina. By developing the solar and renewable energy resources available in our state, North Carolina can generate almost 40% of the energy it consumes. Boone Community Solar was featured in a national report by John Farrell of the Institute for Local Self-Reliance. The report entitled “Community Solar- A New Model For Local Ownership” can be viewed HERE.